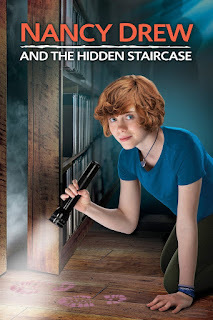 Check out the Nancy Drew and the Hidden Staircase Escape Room & Mystery Match Blog App to solve the mystery and help Nancy out of a jam! How long it take you to crack the code and escape the room? I was a huge Nancy Drew fan growing up. I read all the book and even the Hardy boys ones too. When my daughter was old enough to start reading chapter books, she started out on the Nancy Drew Clue books too. Love that this classic series is making itself known to new generations with a fun cool movie! OneMommaSavingMoney is not responsible for prize fulfillment. Disclosure of Material Connection: I received the above mentioned item for mentioning this movie release on my blog. Regardless, I only recommend products or services I use personally and believe will be good for my readers. I am disclosing this in accordance with the Federal Trade Commission’s 16 CFR, Part 255: “Guides Concerning the Use of Endorsements and Testimonials in Advertising. I did the escape room. It took me about a minute and a half because I did not know that you had to click on the items.